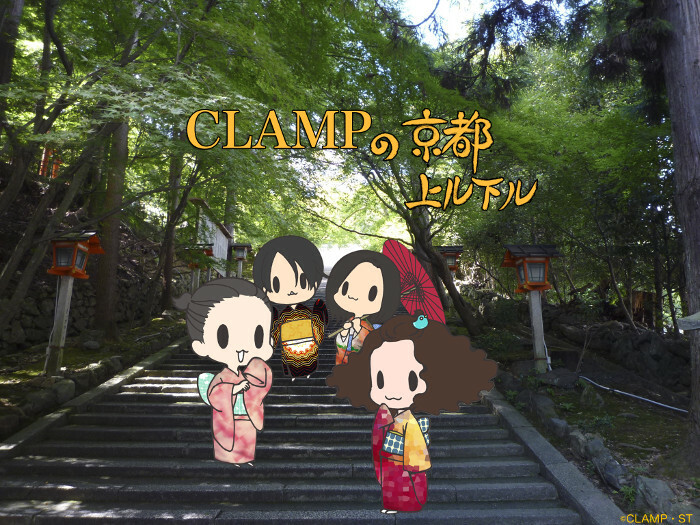 Episode 10 is up for download at CLAMP no Kyoto Agaru Sagaru‘s official website. They started the show reading an e-mail from a listener asking them about the different art materials they use for their series — mainly Chobits and CLOVER. They went on talking about it for 7 minutes (it sounds really interesting I wish I could understand T-T). After that, they went into a long talk about games. Each member mentioned their favorite/current games. A few titles were mentioned such as Megami Tensei (Satsuki) and Front Mission (Ohkawa). They mentioned Card Captor Sakura‘s games produced by ARIKA and the costume design work they did for Tekken back in 2009. At one point, I think Ohkawa asked the others which of their works they would like to see adapted into a game. Mokona said ANGELIC LAYER (that would be fun, indeed!) and Satsuki said an all-star CLAMP characters dance game (amusing to say the least!). -Started with a question of a listener called Asaka, who asked about Chobits, that at that time she has read on an interview that CLAMP used to use ballpens on Chobits art. So she asked if as in CLOVER or XXXHOLiC, Ohkawa decided wich materials to be used, or if it was left to the judgement of the member in charge of main art? -Ohkawa inmediatly responded that commonly she is the one who decides (She’s in everything OMG xD) and indeed in Chobits comic pages they used to use ballpens. -Mokona added that first they tried/experimented a little bit before deciding to go with ballpens. they neeeded to verify how it ended up looking at final printing. -They wanted to give the impression of some sort of rusty image like pencil art. They actually did tried pencils but it wouldn’t go well. -In MKR they used commonly mini-pen at first, but Nekoi mentioned using a water-based fountain pen manufactured by a company named Tube, at first they thought it was very troublesome to work with water based materials but they kept with it because of the good results, and Ohkawa added that is because the line got wider. They did mention seconds before that they used this one when wide lines were needed. -Ohkawa continues asking if there were another ocassion where they have used interesting materials, and everyone replied that it wasn’t that much really. -In CCS the main linning was done with a material that gives the line a brown-color appearence. Nekoi and Mokona added that was Maru-pen (maru=circle). And for color stuff they used to have the common acrylics, but if you quit using it for a long time it hardens so it was a lot of trouble even though it was a material easy to solve when using. -They come back to Chobits and say that for the special Blu-Ray cover, they had to pull out that old material and it was so much trouble since 3 years had passed since the last time they used it and the materials were hard, or they didn’t have the colors that they used to use a lot (xD). Nekoi mentions that she coukldn’t use one particular material because it got lost on the moving to Kyoto. Next, Ohkawa asks how about the old illustrations, do they got mold? And everyone replied it were mainly ok but it does get hard. The materials -Nekoi comments- on the other hand, do decay. Nekoi mentions Ice pink color becoming just transparent water and that she couldn’t get any use out of it. Mokona added that ink itself become like yellow-ish, and everyone agreed that color inks doesn’t last much in general. -Ohkawa says that at commonly they use color ink or copic markers. But it is a lot of trouble until the first concept art is settled. They try several materials, like several pages with Takara ink (takara is a brand), pens or mini-pens, and of course when is decided they stick to that. -So the actual reply to the listener’s question is: the materials are decided by Nanase (she names herself Nanase WTF hahaha), but before that, the artist responsible suggests the materials to be used and they discuss about it all together. But at last the one that decides is herself. -Mokona says that when trying the materials they even verify until the last actual printing of the art. Ohkawa adds they are pretty exigent about these stuff, always thinking in how is going to look at magazine printing step (magazine printing quality as you know used to be very poor). They show each other art drawn used several material and decide all together. -So Ohkawa says to the listeners to take a look at the tankoubons and do maniac comparissons of publishing companies differences (Oh God she is such a troublesome girl! hahaha). -Satsuki also recommends to compare the magazine version with the artbook versions. And Ohkawa interferes saying that probably the one that shows more differences is CCS, since at that time Nakayoshi magazine used to be printed in 4-color (there’s is a huge technical terms here, all I could catch was CMYK) and that black ended up looking like brown. She also says that at that time most of Shojo manga mangakas didn’t use to ink with black ink and that’s why the magazine used to be printed in that special 4-color way. But of course when publishing artbooks or such they use more than 4 color so the illustration gets printed more closely to the original art. Kadokawa’s monthly shonen magazine Shonen ACE is celebrating its 20th Anniversary and a series of special events and issues are planned for the occasion. 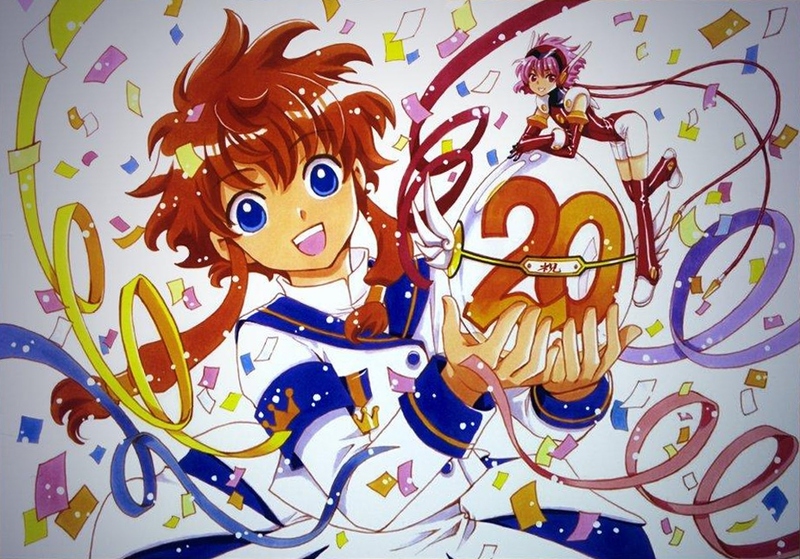 CLAMP drew a new illustration of Misaki Suzuhara and Hikaru, the two main characters of ANGELIC LAYER, which ran in the magazine from 1999 to 2001. It will be featured in one of the magazine’s commemorative issues. A first glimpse of the illustration can be seen below. I can certainly see a small Tsubasa influence but the overall feeling is the same from back when ANGELIC LAYER was still being published. Good job, CLAMP! I will post here in case a high quality version of the illustration comes up. The anime adaptation of Angelic Layer (originally aired in 2001) will get a new DVD Box release and, for the first time, a Blu-Ray release. According to CD Japan, they will be released on March 26 and will feature pictured-label and digipack. Each release also include an original card. The DVD Box will cost 25.200 yens and the Blu-Ray Box 47.000 yens.